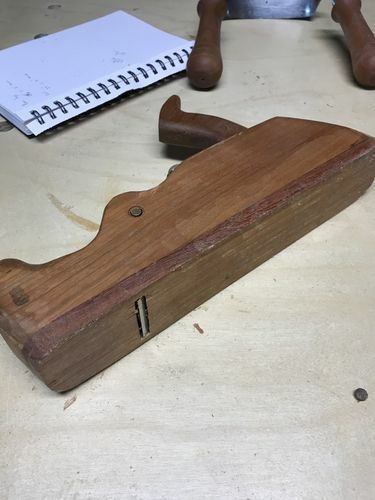 I took a little time to gain some more experience in making traditional hand planes. This one was made from a couple of 2×4 scraps. Obviously not going to be a user given the soft wood but each plane I make I find ways to make the process more streamlined. I’m getting close to working up my nerves to making some smoothing planes out of some beech and maple blanks I have had sitting around. I still need some gouges to be able to add some more of the decorative touches to the planes and make a few more reusable layout gauges. Well if it works I’d say go for a real user! I never ever looked at the coffin planes, Krenov planes are sometimes too much detail for me. For sure Andre. I’m thinking my next planes are going to be users for sure. I hope to get good enough at them to be able to sell them as well. What is the front wedge for? It exposes end grain on the front of the mouth. Which wears much less quickly. It also allow you to keep a tight mouth as the sole is tuned over time. Like the front wedge idea. 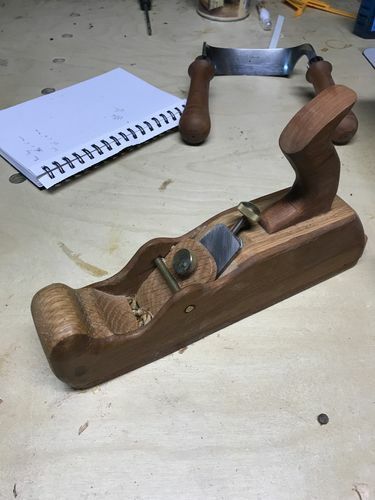 Made one plane with a Veritas kit and it sat forever. However, I’ve been picking it up and using it more. Had to replace (add on) the bottom to close the mouth somewhat. Thanks Todd. I can’t take credit for the front wedge idea. I first saw it on Caleb James smoothing planes. I can only hope to make planes as nice as he does someday. I have found out that it actually gives you a little more freedom when you are opening the mouth. Which is typically one of the harder parts of traditional hand plane construction. For instance, when you are creating either bed and you happen to open it a little too much on the bottom then you can just make a thicker closer “front wedge” that forms the front of the mouth and the wear line. I am definitely still learning where I can make improvements with each plane I make. Brian , nice job and congratulations on your ‘Daily Top 3’ award.